Faced with a shortage of skilled operators, Fijn Mekaniek Nelissen needed to find a new solution to meeting growing orders. To tackle the problem, Nelissen decided to automate machine tending on its Mazak Integrex 200-IV CNC lathe. After consulting the system integrator Robojob, the machining specialist then installed a 6 axis FANUC robot and an 'Integrated Robot System for Chuck Work'. The robots works 24/7, does not get ill or tired and, if the order book demands, will keep on going through the weekend. This frees up the operator to program and set the CNC lathe and do other jobs that Nelissen would otherwise have problems filling. Fijn Mekaniek Nelissen is a company that specializes in machining on CNC machines. The techniques used are turning, milling and wire EDM. The customer base is really varied. The company thus not only has several machine manufacturers among its clientèle, but we have also earned some reputation in the automotive and the aircraft industry. Besides these sectors, Fijn Mekaniek Nelissen also undertakes emergency repairs, something which perfectly connects to the high flexibility that characterizes the company. Paul Nelissen started working on his own in 1990, after working as a foreman for a number of years. He started with one CNC turning and milling machine. As he himself says: "In the beginning, it is 50% hard work and 50% luck." And luck was on his side; the young enterprise soon expanded to what it is today. Undoubtedly, the training as accountant which the businessman had before entering the metal industry has also ensured a sound financial attitude. But what best typifies him and his company is the love and the passion for a perfect workpiece, complying with the client's specifications. "It may not seem special, but making a finished piece from a metal block, which perfectly fits the client's requirements is something wonderful." He also to impart this philosophy to his employees and particularly to the operators of the CNC machines. The turnover of Fijn Mekaniek Nelissen grows at an average of 10% per year, so it always needs more and more machines and men. However, finding people who are sufficiently motivated to learn this high technology job looks like an insurmountable problem. "Today, the perception of a turner and miller is still that of a man in dirty, oil-soaked overalls standing knee-deep among metal shavings," he says laughingly, yet somewhat cynically. While this is far from the truth. The workplace is clean; there is no oil mist hanging in the air and the noise is absent, too. In short, this is a high-tech work environment. The erroneous perception of the profession of a CNC operator is, however, disastrous for young people who aspire for a job in the industry. And the consequence of the low inflow of students in the technical training is also a low outflow. Recruiting someone from the low outflow, who is motivated as well as intelligent and can work pro-actively and independently, is an almost impossible task. Paul Nelissen: "It takes two to five years before I can give work to a CNC operator, who I know will perform his work completely independently. And I am talking about someone with a technical education." Finding people is not the only problem. Later on, it is important to keep the operator's job fun and, above all, challenging. "In machining, the pleasure lies in linking the theory to practice through the creation of a workpiece. For a seasoned operator, the challenge also lies in setting up the machine. When that is behind you and the actual production starts, the fun is gone. What follows is the loading and unloading of the machine. To tackle both the problems, Paul Nelissen decided to proceed with automatic loading and unloading of his Mazak Integrex 200-IV CNC lathe. He consulted the system integrator Robojob. The solution, in concrete terms, consisted of a 6-axis FANUC robot and an IRS-CW system, which stands for 'Integrated Robot System for Chuck Work'. The advanced lathe and milling machine has two chucks. The FANUC robot stands to the left of the machine opening and the inclined setting ensures that it is not an obstacle for the operator. Next to the robot stands the IRS -CW unit managing the infeed of the raw pieces to be turned as well as receiving the finished pieces. For example, the robot takes a raw workpiece from the rack and brings it (after the doors are already opened automatically) to the first chuck. When the operations are performed in both chucks, the robot arm removes the finished workpiece from the second chuck and places it on the IRS-CW. Then the cycle repeats itself. 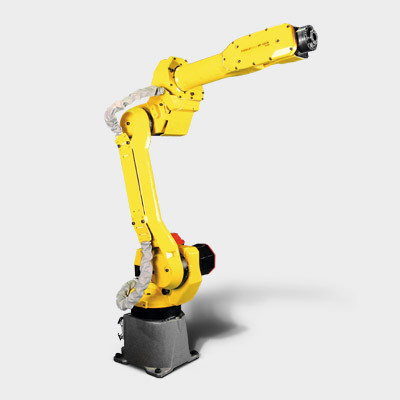 The robot is a FANUC M-120 iA, a 6-axis industrial model with an integrated construction. This means that all control cables are built into in the arm to facilitate the movement and to ensure that the cables are always guarded. The pneumatic lines are also safeguarded in this manner. The arm is controlled by an R-30A control with the control panel (I-pendant) within the operator's reach. As a CNC operator is not a robot programmer, Robojob has designed an interface specifically for loading and unloading of CNC machines. This control is part of the IRS-CW system and forms the connection between the infeed and output of workpieces, the robot and the CNC machine. The setting time of a new cycle is surprisingly short. On an average, setting the loading and unloading of a new workpiece takes about 5 minutes. Of course, newly created programs for later use can be stored, which shortens the setting time for recurrent work even further. The short setting time makes automatic handling possible even for small series. This system manages the infeed of raw components and collection of the finished pieces. Components with different dimensions (diameter: 23 to 250 mm) can be placed without the need for specific grid locations. Depending on the robot, the maximum workpiece weight is 50 kg. The workpieces are placed on servo-controlled inclined plates and remain upright with adjustable workpiece supports. Furthermore, a receiving tray is provided as standard for leakage fluid, with leakage fluid recovery towards the machine. The robot is by default fitted with two grippers (one gripper for the raw product and one gripper for the finished product), which are equipped with the quick change system for gripper claws, developed by Robojob. Changing the gripper claws takes only a few seconds. The system can be further equipped with a gripper magazine and an automatic quick change system for complete grippers. The IRS-CW can also be extended by a simple setup system for automatic loading and unloading of axes. It is important to know that the IRS-CW with FANUC can be adapted for almost all old and new CNC machines. The placement of this system requires two days and is followed up by training for one day, devoted for learning the robot controls. In practice, the learning is much less time-consuming. The operator usually learns up the controls after a couple of hours on the job. Presently the described setup is protected by a transparent Troax closure with two secure sliding doors. The disadvantage is that this solution takes a lot space. It is however perfectly possible - and perhaps more important, also conforming to the new robot standard - to leave out this closure, if a peripheral laser scanner is installed on the robot. This scanner continuously scans the surrounding area and determines whether a detected movement will penetrate the programmed path of the robot arm If so, the system will delay the movement and, if necessary, stop it. The placement of the robot and the stacker, by the way, need not be final. At Fijn Mekaniek Nelissen, Robojob is currently studying the possibility of making the robot and the stacks mobile, so that the setup can also be used for other machines. The price tag is not min. Depending on the chosen robot type and safety, the investment would be between 50 and 120,000 Euro. The question is thus to weigh the cost of the automation against the yield. We will then deduct an average wage cost of 38 Euro. As a comparison, the cost price of a comparable setup varies between 3 and 8 Euro per hour, at least as long as the robot is not written off. Thereafter you only pay for the electrical consumption. Paul Nelissen: "Once set, the robot does its work; it is never sick or tired, works on weekends... and if the automation is restarted, the operator moves to what is essentially his job: programming and setting CNC machine." The business manager is clearly won over by this system. "Soon there will be a new machine, with a robot, that much is certain. It cannot be any other way, because today it is a question of automate or relocate. And I have no interest in the latter."